Last week, we published an article on the game theory of international trade and trade wars. The article included an interactive game in which you (yes, you) were elected president and could pick your own foreign economic policy. Your goal was to maximize the payoff for your country. You could be friendly and cooperative, allowing free trade into your country, or you could be unfriendly and betraying, imposing tariffs. You were then matched against a random FiveThirtyEight reader who had their own strategy. If both sides opted for a lot of betrayal, a trade war broke out, and payoffs were diminished for both sides. And man, do you all get cranky the longer you stick around. Because many readers played this game repeatedly, you gave us a little bit of insight into how trading strategies evolve over time. 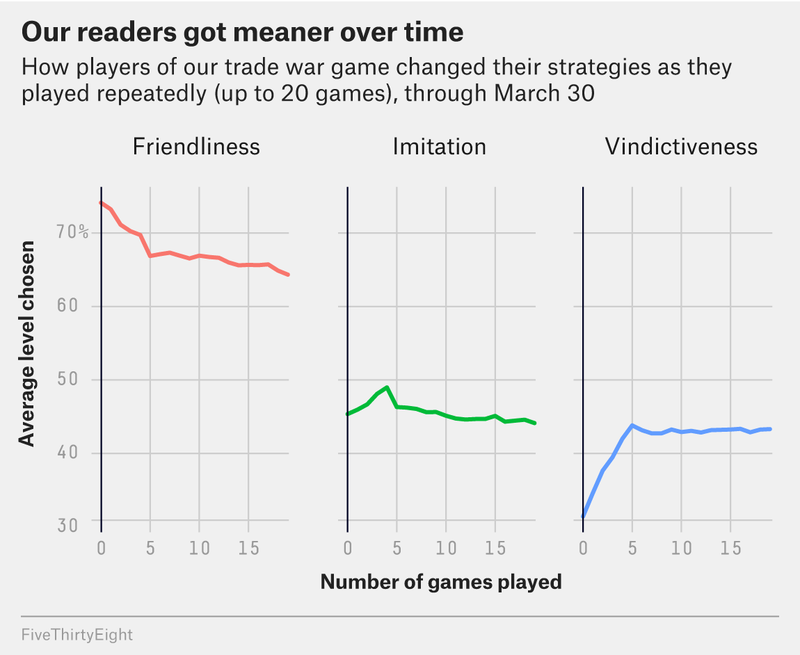 As reader-presidents learned how the game worked and what strategies tended to be successful, they began to favor unfriendliness and vindictiveness. In other words, you turned nasty as you aged. Much like in our earlier nuclear standoff game, players were aggressive — possibly to a fault. In 58 percent of the games we analyzed,1 the winner was worse off than they would have been under free trade. This trade game is essentially a repeated prisoner’s dilemma — a workhorse model of game theory that captures the tradeoff between mutually beneficial cooperation and individually beneficial betrayal. If we play a prisoner’s dilemma just once, there’s only one outcome where neither side can do better with a different strategy: both sides defect. Any strategy that reaches this balance is called a Nash equilibrium, and game theorists crave these solutions. In this case, mutual defection leads to equilibrium because there’s no incentive to cooperate when there’s no tomorrow. Even if we play a prisoner’s dilemma a bunch of times, like over the 100 rounds we simulated in our game, defection still qualifies as an equilibrium because both sides know that in the final round, the best strategy will be to defect, as they once again compete in a game with no future. And if you know your opponent will defect in the final round, you can work backward from there to see that there’s no reason to cooperate in the second-to-last round, which means there’s no reason to cooperate in the third-to-last round, and so on. But if we play a prisoner’s dilemma many, many (in fact, infinitely many) times, game theory tells us that we might expect mutual cooperation. If we don’t play nice, our opponent could punish us tomorrow and the next day and the next day. And for countries in the real world, there are many days of possible future trade. That’s one hypothesis for why international trade barriers have been reduced since World War II. The real world may have (until recently) found its cooperative equilibrium. But Planet FiveThirtyEight is a world apart. Here, apparently, it is a dog-eat-dog world. These numbers come from a slightly smaller data set of a bit under 550,000 games — all the games that had been played by late morning on Friday, when we collected the data.